Police sappers examined and identified the two phosphorus bombs. According to police, such bombs do not cause any more damage than a standard mortar shell. Eshkol Regional Council's security officer, Miki Levy, claimed that such munitions have never been used by the Palestinians, but the police said that this is not the first time phosphorus bombs have been fired from Gaza. Southern Israel communities have been under fire since Wednesday morning, as Gaza terrorists have stepped up their rocket and mortar attacks at Negev residents. Security forces were searching Wednesday morning for a Qassam rocket that apparently exploded Tuesday night in Ashkelon's southern industrial zone, the IDF announced. It was the first time in over a month that Gaza's terrorists fired at the city. By midday Wednesday, the Air Force responded by bombing the Gaza Strip; at least one person was killed and two others were wounded in a southern Gaza strike near Rafah, Palestinian sources said. The IDF reportedly targeted Palestinian smuggling tunnels, killing a Palestinian who worked in the tunnel, AP reported. He was later identified as 21-year-old Wajdi al-Qadi from Rafah. 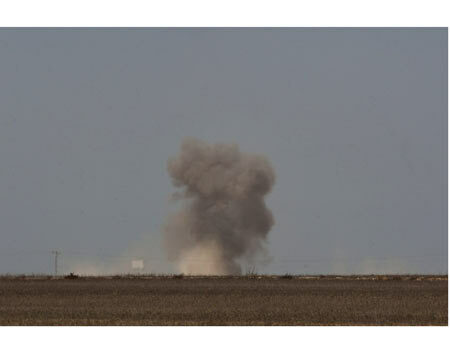 Early Wednesday morning, two mortar shells exploded in Eshkol Regional Council. Another blast was heard in the same area around noon, believed to be the result of another mortar shell. Later, three more mortar shells exploded in the Negev.